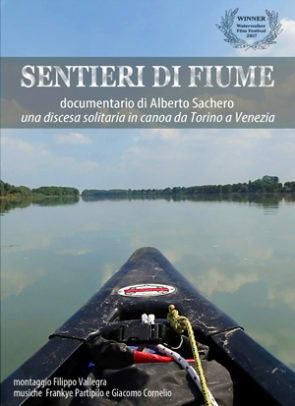 Film-documentary about the solitary descent in canoe from Turin to Venice of a photographer-canoeist from Turin. Shot almost entirely from the canadian canoe (Jessica), tells a slow and silent journey in full respect of nature, in an element (water) where the senses are released in search of sounds, aromas and emotions. A journey in which the many environmental problems that afflict the river Po are almost completely forgotten, as unfortunately many other watercourses, to show instead an extraordinary river world, made of enchanting breathtaking landscapes and encounters with bizarre people who live beyond the banks. A way to show the beauty of the river from the best point of view, to bring people to frequent it, discover it and appreciate it. A 650 km long adventure in the Po river, the Adriatic Sea and the Venetian Lagoon, completed in 2 weeks, alone and in complete autonomy, concluding the journey in the company of the gondoliers in the canals of the wonderful Venice.